M&MS FARMS has a talented crew who work well as a team to run our farm and provide the services we offer. Here’s a bit about each of us, so you know, in advance, what we look like, who we are, and what’s most important to us. 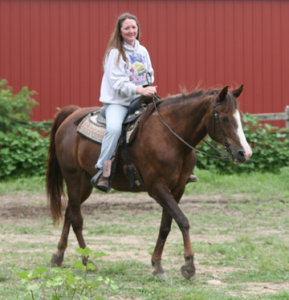 I started M&MS Farms in 1987, when I bought my first horse his very own home. Me & My Shadow is our founding gelding. The farm is named after him. He started me on my quest to learn natural horsemanship: working in sympathy and partnership with a horse, by using kindness, gentleness, extensive groundwork, positive reinforcement, and trust building to evoke the horse’s natural desire to please. It’s focusing on “reading” the horse, clearly communicating, being fair and consistent, and finding solutions. It’s helping each horse reach his or her potential, based on that horse’s specific natural talents and our human need to safely subject that horse to lots of unnatural scary stuff, like trailering, hoof trimming, shoeing, medical procedures, bathing, clipping, and being ridden or driven. Shadow introduced me to another of my passions: using natural horsemanship to “rescue” equine who have fallen on hard times, often through no fault of their own. It’s helping horses and donkeys prepare for the next happy chapter in their lives. 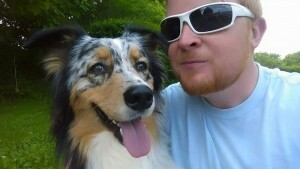 Shadow also rekindled my desire to teach others what I’m so excited about learning and doing. I’ve been a school teacher, a religious school teacher, a youth group advisor, a federal anti-poverty program worker, a social worker, a child advocate, and a state administrator. I’ve been part of a horse rescue and a donkey rescue, contributing my training, organizational, coordination, fundraising, equine behavior, and public speaking knowledge and skills. I have a bachelor’s degree in sociology and secondary education from Northwestern University in Evanston, Illinois, and a master’s degree in public policy and child development from Michigan State University in East Lansing, Michigan. I’m accomplished in Western Pleasure and Hunt Seat riding, beginning with the Class A Morgan circuit. I’m accomplished in pleasure driving. A number of my little horses hold numerous local, Regional and National titles in American Miniature Horse (AMHA) liberty, driving, obstacle, and halter classes. One of my miniature donkeys is a State of Michigan and National Miniature Donkey Association (NMDA) Champion, too. I now have the luxury of doing what I love most: working with four legged creatures and the people entrusted with their care. 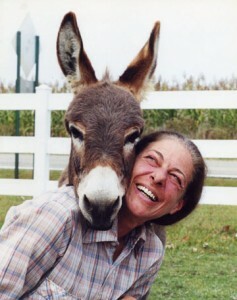 My passions are rescue rehabilitation, human learning, equine learning, and using horses and donkeys to meet human needs. My venue is natural horsemanship. To me, it’s all about leaving a legacy through what I can impart to the four legged ones and the people I touch. I’ve been on and off working at the Farm for 3 years now, since my high school days. I’m back, pretty much fulltime now, because the time is right – for all of us. I very much enjoy everything I do. And I’m learning a lot… with the feed regimens to keep all the horses and donkeys in good shape, when and how to give them medications, and the treatment procedures. I travel around to visit clients with Sue and learn different training techniques with the equines. I also very much enjoy participating in all our special events such as the live nativities at churches, helping adults with special needs ride in a cart behind the minis, and teaching them the basics about the animals at the Farm. I love not having to wonder if I’m appreciated, because the animals show me every day! My favorite thing about the Farm is coming in to happy animals every morning. And I get to make them even happier!! My farm adventure began when I was in high school. I was a farm hand with absolutely no farm experience. That first day was a nightmare in any relationship between a new hire and the farm owner. But Sue didn’t give up on the “little know nothing about horses red headed” kid. Instead, she assigned me duties that would keep me busy and keep the animals safe, while I learned to connect with the animals. And I never gave up on Sue either. Through thick and thin, Sue and I have overcome obstacles that tried our spirits, our bodies, even our relationship. This Stallion Expo marks 12 years of service. There isn’t any more an enjoyable weekend in the year than the one spent promoting the place where I am always welcomed and loved. The farm isn’t just a place for me to lend a handy right arm when it’s needed. It’s also a place that offers me an emotional destressor. Picking up on some of the many techniques Sue uses to connect with the animals, I’m able to let the troubles of a twenty-something life dissipate while I’m there. 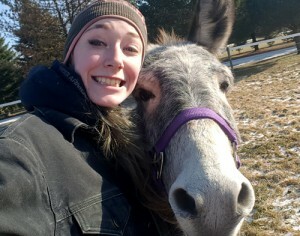 Because … who gives a better hug than a donkey? No matter how much we offer the animals in terms of care and compassion, they return that to us tenfold. Though we don’t see eye to eye on every issue, the bond I have with the farm is one of family strength. It’s my second family. To many more years, Sue. Much love. Growing up, I always had a dog and I wanted to work with animals. But my life didn’t go in that direction, until I met Sue and her 4 legged family through my oldest daughter who had her first job working on the farm. Within a very short time while driving my daughter to work, I found myself staying. And I was quickly drawn in, wanting to be with the animals more and more. I soon began helping out regularly, in every way needed, and my love for them grew and grew. Over the next few years, my other two daughters also began their first jobs at the farm. I always knew animals of all kinds were great companions and good for the soul, but working with Sue and her family, I truly found what I never realized I was missing. Being with the horses and donkeys brings a whole new, unexplainable, inner peace to me. I have been part of the M&MS FARMS family since 2010. And I can’t imagine the rest of my life without them in it. Working with Sue is a job I found through my sister. I’ve also worked at a strawberry farm, a corn maze, and mowing lawns. But working with animals is by far the most rewarding. I’m 15 years old and a Freshman at Williamston High School. 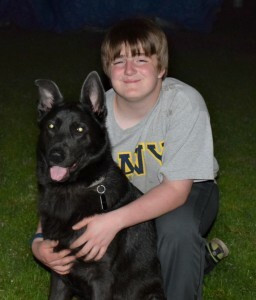 I worked hard to save money for the dog I always wanted… a German Shepherd. He is now a year old. And his name is Winston. My hobbies include: hunting, fishing, biking, spending time with my Mom, and of course spending time with Winston. A new found hobby of mine is photography. My favorite animals at the Farm are the donkeys. That’s because they demand my attention. And they all have different personalities. I have learned a lot from Sue; and I appreciate her taking the time to teach me. Drs. Perry Ragon, Peter Esterline, Rachel Schrader, Lauren Gnagey, Erin Moore, Iris Foote, and Bernadette Hermann from Kern Road Veterinary Clinic (and their entire office and technical staff who get us the help we need, when and how we need it); Christy Cadena of Cadena Equine Veterinary Services; Jenny Kurz, our farrier; Dr. Bonnie Searles, our chiropractor; Gary Fluhr, our primary dentist; and Gail Belcher, our massage therapist.